The whisky spent the first 3 years in a virgin American white oak hogshead and was then transferred to an ex-bourbon barrel for a further 2-year maturation period. It’s bottled at what they call cask-strength at Eigashima (which, somehow, is always 58% there) without chill-filtration or colourings of any kind. It is limited to a mere 90 bottles – a total of 45 liters – which begs the question whether this is a partial release or a leaker… (or just plain smart marketing aimed to still the collectors’ hunger for limited editions). The recent avalanche of young Eigashimas begs a lot of questions, to be honest. It’s understandable that people want to closely follow what’s happening at Japan’s smallest whisky distillery, and that the people at Eigashima want to keep their product in the public eye, but sometimes patience is a virtue… and that certainly applies in this case. 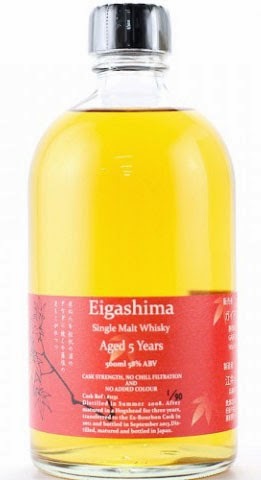 It’s clear that the spirit produced at Eigashima needs time in wood to come into its own as their best releases so far have been the 12yo and 14yo expressions. There’s nothing that old left in the warehouse (the oldest stock being 6yo at the time of writing), but in our humble opinion, the whisky that’s gone into the recent 5yo and 3yo releases for various retailers would have been better left in wood for at least another 5 years. Sometimes a hiatus isn’t a bad thing… Think of what the likes of Johnny Cash, Captain Beefheart, Jacques Brel and King Crimson came up with after being absent from the music scene for a while. We’re convinced Eigashima is capable of similar marvels, but not at the moment… not yet.